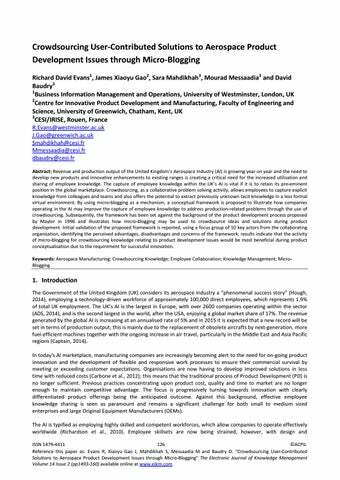 Richard David Evans, James Xiaoyu Gao, Sara Mahdikhah et al manufacturing engineers no longer being required to simply have the knowledge to deliver products, such as commercial aircrafts, but additionally they now have to augment their knowledge and skills to be proficient in the use of Computer Aided Design/ Manufacturing/ Engineering (CAD, CAM, CAE), Product Data Management (PDM) and Product Lifecycle Management (PLM) software and other knowledge-based systems (Bertoni and Chirumalla, 2011). Furthermore, research (McAdam et al., 2008) has shown that engineers in PD teams are increasingly expected to work more collaboratively together across geographical boundaries and between multi-functional business units; additionally, they are expected to be conscious of aerospace regulations, such as the International Traffic in Arms Regulations (ITAR), to which companies such as Airbus, BAE Systems and Lockheed Martin must adhere. On top of this, engineering practices and standards in the AI are traditionally based upon high quality components, highly technical data and extended development and production lead times (Johnstone et al., 2009, Niosi and Zhegu, 2005). Current challenges facing the AI include: 1) The increasing cost of fuel, which as a percentage of operating costs for airlines, has risen to approximately 30% currently compared with only 13.6% in 2001 (International Air Transport Association, 2014); 2) The dramatic rise in air travel by consumers, which has grown by some 8-10% year-on-year (Bouvet et al., 2011) and which is predicted to continue at 4.7% per annum until 2030 (Hough, 2014); and 3) The need for user-contributed social technologies to be introduced to airlines to meet rising customer expectations in terms of communication and entertainment while airborne. These challenges all contribute to global aerospace companies striving to design and manufacture more innovative products which are fuel efficient and provide consumers with cutting edge technology. In order to meet these identified challenges, the global AI industry has been tasked with creating new or innovative enhancements to existing product lines. The development and production of new, highly-innovative products, however, can often involve extended timescales, high costs and significant risk, relying heavily on employee knowledge to generate new ideas. Consequently, the sector relies heavily on Research and Development (R&D) departments and the use of innovative collaboration technologies, such as micro-blogging, is core to competitiveness. The challenge is further extended as AI employees are often co-located or geographically dispersed around their home countries, typically conducting business and collaborating with colleagues based overseas as they are often part of large multi-national organisations. This has created the requirement of aerospace OEMs to seek novel methods to take advantage of the global knowledge base which their workforces already possess. This paper aims to explore one such method, micro-blogging, through the development of a conceptual framework introduced in section 4. The proposed framework aims to illustrate how AI manufacturers may use micro-blogging as a social collaboration mechanism to crowdsource user-contributed solutions from dispersed groups for production purposes, thus creating the potential for more open and innovative R&D in PD teams, which have traditionally suffered from a knowledge-silo culture (Evans et al., 2014a). 2. Related Work 2.1 Keyword Analysis In order to fully appreciate currently-published research relating to the topic of crowdsourcing using micro-blogging as a mechanism for product development activities, a keyword literature analysis was conducted using Elsevier’s academic search engine, Scopus. Numerous keyword strings were searched for using Boolean queries to identify research outputs which were most relevant to the topic of this paper; the first column of table 1 identifies the keyword strings which were identified in published articles together with the year of publication, number of papers published per year and number of publications per type. Firstly, it is interesting to note that zero research was identified which used all three keywords of “Crowdsourcing” / “Crowd-sourcing” and “Product Development” and “Microblogging” / “Micro-Blogging”; n.b. searches producing a value of ‘0’ have been omitted from Table 1. When the search parameters were expanded, as can be seen in table 1, to interchange “product development” for “manufacturing” or “product design”, research showed a total of 30 papers relating to crowdsourcing in product development and manufacturing. Through analysis of this data, it was identified that three of those 30 papers were duplicates i.e. the authors used two similar keyword terms in one research paper e.g. “manufacturing” and “product development”. Of those identified 27 papers, 14 were published between 20132014, 8 papers were written in Universities in the United States, with Germany and the United Kingdom each publishing 5 papers. 15 papers were presented as conference papers and 8 as journal articles. The spelling of crowdsourcing and micro-blogging is not always consistent – micro-blogging is not hyphenated 10 out of 12 times and crowdsourcing is not hyphenated 3 out of 38 times; All research papers identified were published from 2008 onwards, even though the term crowdsourcing was first introduced in 2006; The majority of research into this topic was conducted between 2013-2014 (57.8%) and were predominantly published as conference papers (63.1%) or journal articles (23.6%); Researchers in the USA accounted for 13 (34.2%) published papers, with the United Kingdom (15.7%) and Germany (13.1%) closely behind; and The majority of research published was in the Information Systems, Communications or Human Factors subject areas. Those publications with more than 1 paper published were: ACM’s Computer Communication Review and ACM’s Conference on Human Factors in Computing Systems. AI employees are increasingly using online collaboration and information exchange methods; AI organisations lack a standardised process for capturing and sharing explicit employee knowledge; The use of more interactive Web 2.0 functionality, such as micro-blogging sites, would encourage more formal record keeping, logging of decisions, sharing of knowledge and discussion of ideas; and Increased use of social media applications offers the potential for improved knowledge capture and sharing, problem sharing and, ultimately, innovation. This paper extends this previous work by exploring how micro-blogging, as a mechanism for crowdsourcing, could capture user-contributed solutions to aerospace product development issues. Richard David Evans, James Xiaoyu Gao, Sara Mahdikhah et al 2.2.1 Using Micro-Blogging to Crowdsource The concept of crowdsourcing has been a developing research topic in the field of Information Systems and Design Science since the early noughties (Pedersen et al., 2013), but has received little attention in publicised aerospace literature and, indeed, in the manufacturing industry, in general. In the July/August 2014 edition of IEEE’s Software Journal, Wang et al. (2014) concluded that “micro-blogging as a crowdsourcing mechanism hasn’t received much attention in previous studies”, but that there is “clear potential for it”. Ehrlich and Shami (2010) added that microblogging has generated a lot of research interest in the public domain, but very little is known yet of how employees may make better use of it. At present, the most widely-known application of crowdsourcing is within the recruitment industry, where sites such as Amazon’s Mechanical Turk (https://www.mturk.com/) and microWorkers (https://microworkers.com/) have allowed organisations to crowd source ad-hoc members of staff to complete one-off tasks in return for financial reward. As illustrated in Figure 1, the generic business model is one of companies posting an advert detailing a specific job and potential ‘employees’ then bidding for the opportunity to do the job i.e. the organisation selects who to do the job, based on peer-reviews for previous work carried out and a quoted price. For the organisation, it allows them to tap into a global knowledge base and have the work completed for a fee which they judge to be reasonable and competitive. Further applications of crowdsourcing exist in industry and these include, for instance in the field of astronomy, Galaxy Zoo (http://www.galaxyzoo.org/), which aims to crowd source participants to help understand how galaxies are formed and how they may be classified by shape. Figure 1: Generic Crowdsourcing Business Model The most commonly agreed definition of crowdsourcing was provided by Jeff Howe (2006) in an article written for Wired.com in 2006, where he coined the term ‘crowdsourcing’ by stating that it is “the act of taking a job traditionally performed by a designated agent (usually an employee) and outsourcing it to an undefined, generally large group of people in the form of an open call”. Other researchers (Brabham, 2009, Surowiecki, 2004) have offered their own definitions of the term and these include Pedersen et al. (2013) stated that “Crowdsourcing is a collaboration model enabled by people-centric web technologies to solve individual, organisational and societal problems using a dynamically formed crowd of people who respond to an open call for participation”. Tarrell et al. (2013) offered a more concise definition, concluding that it is the act of “using the collective intelligence of a large group of people to help solve problems”. Researchers (Tarrell et al., 2013) have also used different inter-changeable terms to describe Crowdsourcing, including ‘Peer Production’, ‘User Generated Content’ and ‘Smart Mobs’. Increasing corporate usage of Web 2.0 technologies has driven the development of bespoke applications which employ crowdsourcing principles, although the use of such tools to crowd source is still in its infancy. In the academic world, little research has been conducted into the use of crowdsourcing within a manufacturing environment, especially within the AI, as may be concluded from Table 1. Multi-national OEMs have now started to adopt crowdsourcing as a method for problem solving, but current academic research mainly focuses on the activity from the point of view of companies seeking input from external sources i.e. using crowdsourcing as a mechanism to engage with potential customers or suppliers. Closely aligned to this paper, Yu and Nickerson (2011), in the field of product design, proposed a sketch combination system which was tested by 1047 participants. Each member of the crowd submitted sketched designs of chairs for children whilst other crowd members evaluated the contributions; this allowed the problem owner to develop a complete product through iterative crowd design. Also in the field of product design, Müller, Thoring and Oostinga (2010) developed an online crowdsourcing game, which allowed designers to collect empirical data to understand what meanings users associate with certain shapes; they aimed to develop a crowdsourcing-based method to establish common meaning for shapes/forms. Richard David Evans, James Xiaoyu Gao, Sara Mahdikhah et al organisations, in particular, where a â&#x20AC;&#x2DC;knowledge siloâ&#x20AC;&#x2122; culture is recognised to often exist, there is frequently no incentive for employees to look beyond their familiar workplace setting of nearby colleagues as sources of information. Web 2.0 technologies, however, can help overcome such barriers by encouraging more open communication and knowledge sharing. Expertise and solutions to problems need no longer remain concealed as they may be actively sought out and elicited in a more informal manner. Web 2.0 tools allow for visible communication and the positive input of any employee to collaborative problem solving; consequently, this can be recognised and, indeed, rewarded by management. 3. Methodology In order to create the proposed framework, an exploratory investigation was conducted within a collaborating aerospace OEM between October-December 2014. The investigation produced an as-is process model which was created to identify the key processes employed by PD teams when searching for ideas and solutions to identified problems relating to design and production. The captured process model was then embedded into the created framework, shown in Figure 2, which identifies 4 key actors for the successful identification of solutions to identified problems by product development teams. In order to validate the proposed framework, a one-hour focus group meeting was held with 10 employees from the collaborating organisation in June 2015. This allowed for the identification of the perceived advantages and disadvantages of the framework, detailed in section 6. Activity Product Development Team (PDT) details problems and issues relating to design and production. PDT delegates problems to designated Problem Owner (PO) to elicit potential solutions from others (Crowd). PO shares problems with online micro-blogging community using specific keyword-rich #Hashtags and targeted @UserAccount; invites input relating to potential solutions – contributions also encouraged from the wider crowd through re-posting. Specific problems/issues refined informally through further messaging between Crowd members and PO. Members of the Crowd suggest ideas and propose potential solutions with one or more emerging to become Solution Providers (SP’s). PO communicates specifically with SP’s to evaluate, develop and refine potential solutions, although communication remains visible to members of the Crowd to allow for further input. PO presents potential solutions to PDT for discussion and feedback; further development/ refinement of ideas may be requested from the Crowd, on an iterative basis. When preferred solutions agreed, PDT authorises implementation with the possibility of SP’s being involved in the deployment. Constructive feedback given to SP’s by PDT, with potential financial reward. 5. Analysis of Proposed Framework Howe’s (2006) coining of the term “Crowdsourcing” in 2006 highlighted three key actions to harness the full benefits of using crowdsourcing. Firstly, the specified task must be solvable by a large group of people, whether co-located or dispersed. Secondly, the problem owner must have access to a large group of people that are able to work collaboratively or independently towards a solution, and thirdly, but possibly firstly, the problem owner must be able attract people to join the large group (crowd) via an open call. The proposed framework meets all three characteristics identified by Howe by 1) allowing the problem owner to send out a company-wide message either via an open call to all or via targeted messages using specified @UserAccount’s or #Hashtags; 2) if the problem is unsolvable within the organisation, the problem owner can make the problem transparent outside of the organisation by posting on an external micro-blogging site, although this is not always encouraged, especially in security-conscious industries, such as the AI; and 3) crowd members are able to work collaboratively by using specified project #Hashtags or are able to work independently and setup a private dialogue directly with the problem owner, if preferred. When consideration is given to how micro-blogging could be integrated into the traditional product development approach to assist with the crowdsourcing and solving of problems, it can be illustrated against the process proposed by Maylor (1996), shown in Figure 3. During the identification of customer needs, the marketing department of a company may use micro-blogging to communicate with current or potential customers to identify their needs and record any problems previously experienced with current products. During the product design stage, designers could use micro-blogging for project team collaboration and to confirm the marketing brief. During manufacture, microblogging could be used by engineers to discuss and solve any issues which arise during production. Finally, once the product is manufactured, marketing can again use micro-blogging to sell the product, via a social media campaign, but can also utilise it for recording initial problems/faults experienced by customers. 6. Validation Exercise to determine Advantages and Disadvantages of the Proposed Framework For initial validation of the proposed framework, a one-hour long focus group with 10 employees from the collaborating AI OEM was conducted in June 2015. The meeting allowed for the identification of perceived advantages and disadvantages of the framework by employees of the organisation who would play a ‘key actor’ role within the crowdsourcing process. Results of this meeting are now provided. 6.1 Perceived Advantages The focus group revealed that the proposed micro-blogging framework would be welcomed within the product development environment of the collaborating company, with interviewees agreeing that “right now, knowledge is stored in very few places. Knowledge dispersal can only be a positive thing”. However, numerous concerns do exist, as recognised in section 6.2. Electronic Journal of Knowledge Management Volume 14 Issue 2 2016 With regard to perceived advantages, interviewees believed it would be most beneficial during product conceptualisation; this is due to “most of our ideas and problems arise during initial project meetings”. One respondent stated that the “advantages would be endless. Across the different company sites there are people dealing with the same or similar problems. At present, there is a lack in communication or collaboration between these people and micro-blogging or something similar could help solve this issue”. A further comment was made stating “collaboration is generally driven at senior level and often in response to a programme specific requirement. A developed tool, based on the framework, would allow us to effectively make decisions at production level”. With respect to security, all interviewees concurred that “if relevant knowledge is shared with people at the correct security level, there should be no issues…the benefits will greatly outweigh any security concerns”. Interviewees recognised that micro-blogging would allow PD engineers to “contribute information towards a collective project resource”, but that it will depend on “peoples’ willingness to create and share ideas”. One respondent acknowledge that it would allow his team to “find each other and get more personally involved”, allowing employees to “identify experts on any given subject”. Finally, a major advantage was acknowledged by all – “it would facilitate discovery by removing silo walls”. 6.2 Perceived Disadvantages and Concerns The meeting raised a number of disadvantages and concerns relating to the proposed use of micro-blogging within an AI organisation product development environment. Firstly, security was seen as a major inhibitor to successful implementation. Interviewees reported that safeguards would need to be put in place, but they were confident that they could be. Documentation which was shared via the micro-blogging tool would need to meet required security levels and must be “assured as free from ITAR and UK security classifications”; interviewees were concerned with how this could be done effectively. User training was raised as a major concern for the framework and any developed tool based upon it. Interviewees reported time constraints with regard to training could be an issue and that policies would need to be put in place which taught employees what they may and may not share outside of the PD environment; interviewees concurred that “people could inadvertently make something public to the general crowd”. One interviewee added “I think it will be difficult to encourage people to share”, while another added that “access control, particularly across countries, is an area for concern”. A further disadvantage relating to employee knowledge was that interviewees felt that their intellectual capital or product knowledge may be leaked outside of the organisation through sharing or “re-tweeting”. One respondent identified a potential issue with regards to the user interface of any developed tool, stating that “a key aspect is the user interface. Make it simple to use and people will use it. Make it difficult to use and people won’t use it”. A final conclusion by all key actors was that the developed micro-blogging tool, based on the proposed framework, must be embedded into current systems which the PD teams are using, such as PTC Windchill, and not developed into “yet another tool” which becomes redundant over a period of time. 7. Conclusions and Future Work Crowdsourcing within enterprises offers AI organisations and those operating in other industries the ability to capture problem solving knowledge from network-connected contributors via the use of Web 2.0 technologies. This paper proposes a methodological crowdsourcing framework which enables users to elicit solutions to PD problems through the mechanism of micro-blogging. It empowers problem owners to reach out to targeted or unfamiliar colleagues who may be either co-located or dispersed within the business environment. As with the majority of Web 2.0 technologies which facilitate user-contributed content, crowdsourcing is susceptible to possible interference during usage, including the submission of inaccurate or incomplete knowledge being from colleagues. By including the ‘moderator’ role, it enables trusted users within the organisation are enabled to edit submitted content and delete inappropriate contributions. Motivational factors also come into play when usercontributions are concerned; companies may wish to put in place reward or recognition mechanisms to promote the contribution of solutions to recognised problems. Richard David Evans, James Xiaoyu Gao, Sara Mahdikhah et al Large multi-national organisations may face problems with regard to language barriers and may wish to incorporate a multi-lingual translation service into the micro-blogging tool to enable automatic translation of content for colleagues from overseas locations to be able to read problems being faced. A ‘monetary’ award for contributions is also recognised in the literature and could be employed within the framework to improve the sharing of solutions to identified problems. Of course, it should be acknowledged that certain barriers may exist if organisations wish to use the proposed framework with external micro-blogging tools, such as Twitter.com. These could include unwanted hijacking of discussions by other Internet users who simply ‘guess’ #Hashtags which project groups are using. Indeed, as the aerospace industry is one which is highly security conscious, organisations must also make sure that documents which include sensitive material are not shared on these sites and, for that reason, the authors of this paper recommend that an internal solution based on the framework proposed is developed, rather that incorporating the framework using an external micro-blogging website. In large organisations, future work may include the incorporation of a usertagging mechanism, which allows users to target specific groups of employees within the organisation, rather than sending out their ‘issues’ to the whole Crowd; this should assist in the minimisation of problem-overload. Finally, from the analysis of the validation study, it can be concluded that employees of the collaborating company believe that the usage of micro-blogging for crowdsourcing ideas and solutions to identified production problems would be beneficial. Further research exploring how the framework may be embedded into bespoke product development activities would be seen as beneficial. Acknowledgements This paper is based on work funded by the European Program INTERREG IVA France-Channel-UK under the project “Building an Expertise Network for an Efficient Innovation and Training System (BENEFITS)”. The authors would like to thank the collaborating company who assisted with the initial investigations. References ADS. 2014. Aerospace. [Online]. Available at: https://www.adsgroup.org.uk/pages/62968081.asp [Accessed on 02 August 2014]. Aerospace Industries Association 2010. Disruptive Information Technologies - Special Report. Arlington: Aerospace Industries Association. Arakji, R. Y. & Lang, K. R. 2007. Digital Consumer Networks and Producer-Consumer Collaboration: Innovation and Product Development in the Video Game Industry. Journal of Management Information Systems, 24 (2), pp. 195-219. Argote, L., Beckman, S. L. & Epple, D. 1990. The Persistence and Transfer of Learning in Industrial Settings. Journal of Management Science, 36 (2), pp. 140-154. Beckman, T. 1997. A Methodology For Knowledge Management. International Association of Science and Technology for Development AI and Soft Computing Conference. Banff, Canada. 27 July - 01 August 1997. Bertoni, M. & Chirumalla, K. 2011. Leveraging Web 2.0 in New Product Development: Lessons Learned from a Cross-company Study. Journal of Universal Computer Science, 17 (4), pp. 548-564. Bouvet, A., Gill, N. & Nadkarni, S. 2011. The Changing Face of the Aerospace and Defence Industry. In: Capgemini Consulting Group. Brabham, D. C. 2009. Crowd sourcing the public participation process for planning projects. Journal of Planning Theory, 8 (3), pp. 242-262. Captain, T. 2014. Global Aerospace and Defence Industry Outlook: Expect another record year for commercial aerospace and continued declines in defence. In: Deloitte Global Services Limited. Global Aerospace and Defense Industry Outlook: Deloitte. Carbone, F., Contreras, J., Hernández, J. Z. & Gomez-Perez, J. M. 2012. Open Innovation in an Enterprise 3.0 framework: Three case studies. Journal of Expert Systems with Applications, 39 (10), pp. 8928-8939. Dyer, J. H. & Singh, H. 1998. The Relational View: Cooperative Strategy and Sources of Interorganizational Competitive Advantage. Academy of Management Review, 23 (4), pp. 660-679. ECORYS. 2009. FWC Sector Competitiveness Studies - Competitiveness of the EU Aerospace Industry with focus on: Aeronautics Industry. In: ECORYS Research and Consulting. Ehrlich, K. & Shami, N. Microblogging Inside and Outside the Workplace. 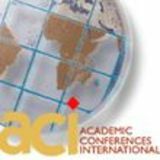 2010. International AAAI Conference on Weblogs and Social Media. George Washington University, Washington DC, USA. 23 - 26 May 2010, pp. 42-49. Evans, R. D. , Gao, J. X., Owodunni, O., Shah, S., Mahdikhah, S., Messaadia, M. & Baudry, D. 2014a. A Framework for Improving the Sharing of Manufacturing Knowledge through Micro-Blogging. Advances in Production Management Systems. Innovative and Knowledge-Based Production Management in a Global-Local World. Ajaccio, Corsica, France. 20-24 September 2014. Springer Berlin: Heidelberg. Evans, R. D. 2013. An Enterprise 2.0 Groupware and Framework to facilitate Collaboration and Knowledge Sharing in Dispersed Teams during the Product Development Process within the Aerospace and Defence Industry. Rochester, UK: BAE Systems & University of Greenwich. Electronic Journal of Knowledge Management Volume 14 Issue 2 2016 Evans, R. D., Gao, J. X., Martin, N. & Simmonds, C. 2012. An Investigation into the Potential Use of Social Media Technologies to Improve the Product Development Functions within the Aerospace and Defence Industry. International Conference on Manufacturing Research, 11 - 13 September 2012. Aston Business School, Birmingham, UK, pp. 718-723. Evans, R. D., Gao, J. X., Martin, N. & Simmonds, C. 2014b. Using Web 2.0-Based Groupware to facilitate Collaborative Design in Engineering Education Scheme Projects. International Conference on Interactive Collaborative Learning. Dubai, United Arab Emirates. 03-06 December 2014, pp. 397-402. Evans, R. D., Gao, J. X., Woodhead, S., Martin, N. & Simmonds, C. 2012b. An Investigation into Collaboration and Knowledge Managementduring Product Development in the Aerospace and Defence Industry. International Conference on Knowledge Management and Information Sharing. Barcelona, Spain. 04-07 October 2012. SciTePress, pp. 113-118. Harden, G. 2012. Knowledge Sharing in the Workplace: A Social Networking Site Assessment. International Conference on System Sciences. Hawaii, USA. 04-07 January 2012, pp. 3888-3897. Hough, D. 2014. The Aerospace Industry. In: House of Commons Library. Howe, J. 2006. The Rise of Crowdsourcing. [Online]. Available at: http://archive.wired.com/wired/archive/14.06/crowds.html [Accessed on 31 July 2014]. International Air Transport Association. 2014. Fact Sheet: Fuel. Johnstone, S., Dainty, A. & Wilkinson, A. 2009. Integrating Products and Services Through Life: An Aerospace Experience. International Journal of Operations & Production Management, 29 (5), pp. 520-538. Kaufmann, N., Schulze, T. & Veit, D. 2011. More than fun and money. Worker Motivation in Crowdsourcing – A Study on Mechanical Turk. Americas Conference on Information Systems. Detroit, USA. 04-08 August. Paper 340. KPMG. 2013. 2013 Global Aerospace & Defence Outlook. In: KPMG International. Kwak, H., Lee, C., Park, H. & Moon, S. 2010. What is twitter, a social network or a news media? International Conference on World Wide Web. Raleigh, USA. 26-30 April 2010, pp. 591-600. Lee, I. 2013. Trends in E-Business, E-Services, and E-Commerce: Impact of Technology on Goods, Services, and Business Transactions, Western Illinois University, USA, IGI Global. Maylor, H. 1996. Project Management, London: Pitman Publishing. Mcadam, R., O'hare, T. & Moffett, S. 2008. Collaborative knowledge sharing in Composite New Product Development: An aerospace Study. Technovation, 28 (5), pp. 245-256. Moon, J. Y. & Sproull, L. S. 2008. The Role of Feedback in Managing the Internet-based Volunteer Work Force. Journal of Information Systems Research, 19 (4), pp. 494-515. Müller, R. M., Thoring, K. & Oostinga, R. 2010. Crowdsourcing with Semantic Differentials: A Game to Investigate the Meaning of Form. Americas Conference on Information Systems. Lima, Peru. 12-15 August 2010, Paper 342. Niosi, J. & Zhegu, M. 2005. Aerospace Clusters: Local or Global Knowledge Spillovers? Journal of Industry and Innovation, 12 (1), pp. 5-29. Nonaka, I. & Takeuchi, H. 1995. The Knowledge-Creating Company. Oxford University Press: NewYork. O'dell, I. & Grayson, C. J. 1998. If only we know what we know. New York, USA. Free Press. Paroutis, S. & Al Saleh, A. 2009. Determinants of knowledge sharing using Web 2.0 technologies. Journal of Knowledge Management. 13 (4), pp. 52-63. Pedersen, J., Kocsis, D., Tripathi, A., Tarrell, A., Weerakoon, A., Tahmasbi, N., Xiong, J., Deng, W., Oh, O. & De Vreede, G. Conceptual Foundations of Crowdsourcing: A Review of IS Research. Hawaii International Conference on System Sciences. Wailea, Maui, USA. 07-10 January 2013, pp. 579-588. Razmerita, L., Kirchner, K. & Sudzina, F. 2009. Personal knowledge management: The role of Web 2.0 tools for managing knowledge at individual and organisational levels. Online Information Review. 33 (6), pp. 1021-1039. Richardson, M., Danford, A., Stewart, P. & Pulignano, V. 2010. Employee participation and involvement: Experiences of aerospace and automobile workers in the UK and Italy. European Journal of Industrial Relations. 16 (1), pp. 21-37. Riege, A. 2005. Three-dozen knowledge-sharing barriers managers must consider. Journal of Knowledge Management. 9 (3), pp. 1835. Savage, N. 2012. Gaining Wisdom from Crowds. Communications of the ACM. 55 (3), pp. 13-15. Shin, M., Holden, T. & Schmidt, R. A. 2001. From knowledge theory to management practice: Towards an integrated approach. Journal of Information Processing and Management. 37 (2), pp. 335-355. Simatupang, T. & Sridharan, R. 2002. The Collaborative Supply Chain. International Journal of Logistics Management. 13 (1), pp. 1530. Sonnleitner, E., Kung, J., Schafer, D. & Wenzel, H. 2013. A Crowd-Sourcing Approach for Area-Wide On-line Building Assessment Towards Earthquake Engineering. International Workshop on Database and Expert Systems Applications. Los Alamitos, USA. 26-30 August 2013, pp. 3-8. Surowiecki, J. 2004. The wisdom of the crowds. New York, USA: Anchor Books. Tarrell, A., Tahmasbi, N., Kocsis, D., Pedersen, J., Tripathi, A., Xiong, J., Oh, O. & Devreede, G. 2013. Crowdsourcing: A Snapshot of Published Research. Americas Conference on Information Systems. Chicago, USA: Association for Information Systems. Chicago, USA. 15-17 August 2013, pp. 1-14. Wang, X., Kuzmickaja, I., Stol, K., Abrahamsson, P. & Fitzgerald, B. 2014. Microblogging in Open Source Software Development: The Case of Drupal and Twitter. IEEE Software. 29 (3), pp. 72-80. Yu, L. L. & Nickerson, J. V. 2011. Generating Creative Ideas Through Crowds: An Experimental Study of Combination. International Conference on Information Systems. Shanghai, China. 04-07 December 2011, Paper 21.